Churn rate is one of the defining metrics for any subscription-based business. Keeping an eye on your churn is the easiest way to check if your customers are happy with what they are getting. Even though it’s not the only tool that will help you monitor your business, it’s one of the more reliable ones. 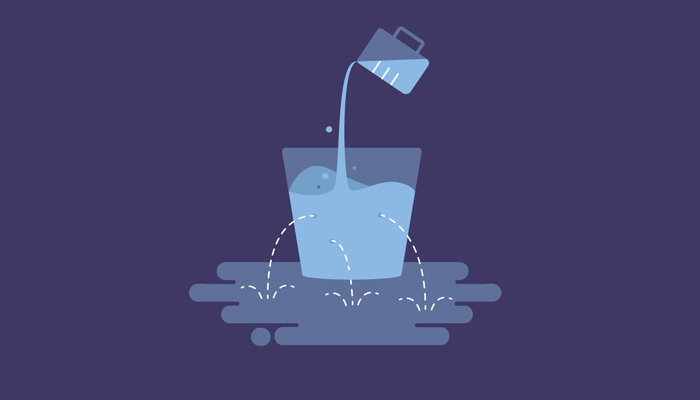 As soon as something goes wrong, your churn will reflect that. Calculating churn is not only for companies that look to fix their growth problems. If your net number of customers keeps growing, you can still use this metric to check if you could be growing faster. Get it right, and your revenue will skyrocket. Get it wrong, and you will spend time and resources just to keep the current number of customers. Churn rate is the rate at which you are losing customers. That’s the general idea at least. A lot of additional aspects have to be considered before calculating churn. But let me show you an example first. Let’s say that at the beginning of April your business had 1000 customers. 50 out of those customers will unfortunately leave for various reasons. With these kind of numbers, you would be experiencing a monthly customer churn rate of 5 percent. This means that 5 percent of the starting pool of customers left (churned out). At the end of the next month, you will do the same math. But this time you will use the new number of customers (including all the new customers that came to you in April). You then check how many disconnects you had in May and calculate churn. By doing this month after month, you will be able to track any changes in the churn rate. You will be able to tell if more or less of your customers are leaving – expressed not as a number, but as a percentage. You will know if you’re experiencing any problems or if the solutions you used to combat those problems actually work. Lower churn rate is always good news. b) If you didn’t break something by accident. Churn rate is a godsend for any subscription-based business. It’s used by telecom companies to see if enough people are using their phone services. SaaS companies use it to check if their user base grows and if users see value in the software. If you want your subscription-based business to grow, the number of customers you get every month needs to be higher than the number of customers you are losing to churn. Customer churn rate is not the only metric you can follow. Apart from checking how many customers you lose over time, you can also check how much revenue you lose. Not every customer that is not satisfied with what they are getting has to leave immediately. Instead, they can switch to a lower plan, or use your product to a lesser degree (for example send less emails through your email marketing service). This leads to a smaller revenue you get from that customer, or lower lifetime value of the customer (LTV). This can result in a peculiar situation in which you don’t lose customers and you still see that you’re earning less and less. This cuts both ways. You can see that you are getting more and more customers and your churn goes down but your revenue seems to stay the same. If you see that your revenue churn starts to increase, it’s an early sign that users don’t see enough value in the plan they are using and switch to cheaper plans or cancel the service. This can also mean that you’re getting a lot of new customers in the cheaper plans but losing customers in the more expensive plans. Before you can do any analysis, you need a way to calculate customer and revenue churn. The most basic way you can calculate churn for a given month is to check how many customers you have at the start of the month and how many of those customers leave by the end of the month. Once you have both numbers, divide the number of customers that left by the number of customers at the start of the month. This will be your basic churn rate. Multiply it by 100 to get a percentage. You can forget about any new customer acquisitions. That will matter in the next month. This is the most basic approach you can take for a month-to-month churn rate. You can also calculate it annually by doing the same math but looking at the number of customers at the start of the year and then checking how many customers left during that year. Most subscription-based businesses allow for a minimal subscription of one month. If the minimum subscription length is shorter in your company (for example one week) you can add new customers who churned out to that metric at the end of each week. 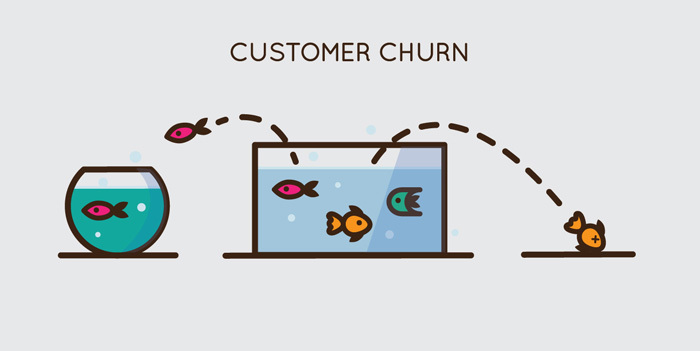 An alternative way to calculate churn proposed by Recurly is to count the number of chances a customers had to leave and check how many times they used that chance. This will allow to to check the churn for each day separately and will provide more precise data than checking monthly churn. You start in the same way: check how many customers you had at the start of the month. Next, multiply that number by the number of days in that month. This will be all the chances your customers had to leave. One day for one customer equals one chance to leave. In this case, we will also consider the new customers. See how many new customers you got, multiply it by the number of days in the month and divide it by two. Since these customers won’t have as many chances to leave, we need to limit the number of their churn chances a bit. We assume that, on average, a new customer will be using your product for half a month. Hence, we divide the number of churn chances by two. Once you have both numbers, simple add them up. Now, divide the number of customers who left in this month by the number of the churn chances. The result will be the churn rate for one day. Multiply it by the number of days in a month. You now have the churn rate for that month. In this example, we have a company that started out March (31 days) with 1000 customers and gained 240 new customers over the course of the month. 70 customers left during those 31 days. This means that, out of 34720 churn chances, 70 customers used the chance. This gives us a 6.25 percent monthly churn rate for the company (you need to multiply it by 100 if you want to get the percentage value). No matter which method you are using to calculate your churn, you need to go deeper down the rabbit hole if you want more precise results. One way to do that is segmentation. Instead of looking at all of your customers or revenue, you can be looking at customers for specific plans. This also works for revenue: you can be looking at revenue gained from monthly and annual renewals separately. It’s still not entirely an exact number but it’s a lot more precise than simply throwing everything together. So for different plans, use separate churn metrics. For different volume, for separate churn metrics. For different length of subscription, you should also use separate churn metrics. And the list goes on. Churn rate allows you to look at the immediate results of your actions. How much it can attributed to different factors is a whole another story. You can never say that increase in churn is a result of this or that. It’s always a more or less educated guess. Customer satisfaction: the more satisfied customers are with your service, the less likely they are to leave when something goes wrong. Customer delight: this may look similar to good customer service but it’s actually a lot more difficult to get. It’s the measure of going the extra mile, providing something extra for the customer. Switching costs: The more expensive it is to move to a competitor, the less likely a customer is to move. This counts for both the implementation costs as well as staff training costs. Value: If you fail to show enough value to customers, they won’t be able to justify paying for your product. When working with these factors, it’s hard to say what you should consider an acceptable level of churn. Depending on the type of industry you’re in or the customer base you have (B2C vs B2B), the optimal churn rates will vary. There’s one golden rule that applies to all companies though: negative churn is your end goal. It’s the magical Neverland you want to reach with your churn reduction efforts. When you reach negative customer churn, you not only don’t lose any customers but also gain new. With customers numbers it’s nearly impossible. With revenue it a lot more doable, but still really difficult. Over the years, we tried multiple ways of decreasing churn here at LiveChat. Some of them worked out better, some worse. And some of them didn’t work for us at all. Making sure that payments renew reliably will be one of the biggest game changers in terms of reducing customer churn you can get. We’re currently using Recurly to make sure that our customers can automatically renew their licenses at the end of each billing cycle. This may seem like a small thing but it makes a lot of difference. It’s one less action a customer needs to take care of. We used to have hundreds of chats each month from customers who wanted to handled various billing matters. Since implementing the automatic payment renewal, the number of these cases decreased to only a couple of cases each month. Reminding users about an upcoming account expiration is another great way to make sure there are no holes in your revenue. A simple email stating that a user’s account will expire in a couple of days will be enough to get some businesses to add their credit card details and make a payment. To give you an idea on the effectiveness of these emails, around 80 percent of customers who get them go on to renew the license. We found out how successful this method can be when we sent a reminder like that by mistake to all our customers a couple of years ago. Even though most customers had already paid for their license, a lot of them came to our website just to make sure their payments came through and that they don’t actually have to renew them yet. Another simple fix for your churn rate you can make is adjusting the dunning period a bit. It’s the time a payment gateway will try to process a customer’s payment. It’s usually a set number of days after which the payment gateway will stop trying to process the payment and will mark the customer’s account as expired. We had it initially set to 9 days. By adjusting it just a bit and adding additional 3 days, we saw a 15 percent increase in the number of customers who eventually made a payment after it was first rejected. As I’ve already mentioned, customers have to see value in your product. If there is something standing in the way of that value, you can try to help the customer remove those obstacles by providing extra services and knowledge. In the case of LiveChat, there are two potential problems a new customers might face. First, they need traffic. Without traffic, they won’t get chats. Second, they need someone to handle the chats. Without these two things, our customers won’t see value in LiveChat. To help our customers find value, we supply them with knowledge they can use to get more traffic to their website. Through various guides and blog articles, we show them how they can draw more traffic to their sites. For customers who already have traffic but don’t have the necessary staff, we created Experts Marketplace – a service that allows them to easily find individuals or businesses who can provide support outsourcing services. If you’re doing marketing automation, you can also use it to decrease your churn rate. It’s one of the more scaleable methods you can use as it doesn’t require a whole lot of oversight once it’s set up. The basic idea here is to keep pointing the customer in the right direction even after the onboarding process ends. You don’t have to stop providing knowledge or helpful tips after somebody becomes a customer. By showing customers different parts of your product and teaching them how they should use it, you can prematurely solve a lot of potential problems. One of the things that didn’t really work for us is using a scoring system to determine the ‘health’ of individual customers. A scoring system helps you decide which customers need some extra attention based on a number of predetermined factors. Every time a user performs a certain, desired action, they are assigned a set amount of points. For example, they start using a certain feature in your software, they get some points. The more points they have, the ‘healthier’ your relation with the customer is. This is based on an assumption that a customer with a perfect score will never want to leave your business because they are getting so much value from it. And the more points they have, the more value they saw. That’s the idea anyway. It makes a lot of sense on paper, but we found it very hard to decided on the factors we should include in the scoring system. The sheer number of customers we have (nearly 15,000 at the moment) made it very hard to find that perfect scenario. Our customers come up with new ideas on how to use LiveChat almost daily and it’s hard to ‘frame’ all of them with a couple of predetermined factors. As a result, we had a lot of weird situations. We had customers with really high scores leaving without any apparent reason. We also had situations where businesses that should churn out (based on the number of points they had) continued to use LiveChat for months. In the future, we want to do even more to combat customer churn. For example, we want to start doing regular health checks for our customers. The plan is to have one of our Customer Success Managers reach out to customers via chat or email and make sure that everything is going fine on the customer’s side. We also plan to segment these health checks a bit. For bigger customers that bring in more revenue, we want to switch to calls. There are far fewer of these customers so calling them is much more doable than trying to call each and every customer. And this just what we’re planning to do right now. I’m sure we will want to test plenty of other ideas to combat our churn rate before the end of the year. Since churn is not something you want to leave for later, I’m sure you will want to do the same in your business. 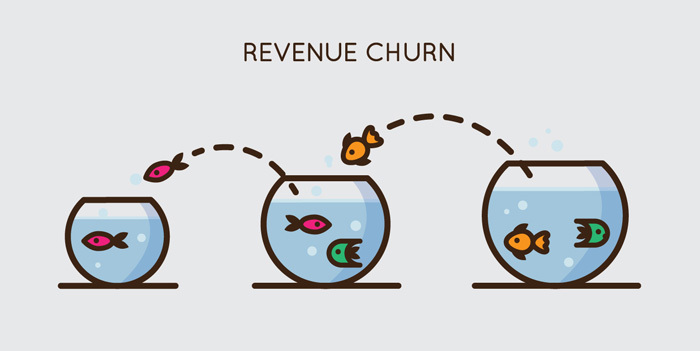 What is the current state of customer or revenue churn in your company? Are you doing anything to deal with it? What worked in your case? We’ll be happy to know as you have never too much good ideas to test out when it comes to decreasing customer churn.